After writing or curating 2,000 K-12 tasks and course blueprints, Illustrative Mathematics decided to try writing a fully formed curriculum. What were our guiding principles? How did we translate those lofty ideals into concrete lesson plans? What did we learn from the craziest year and a half of our lives? And how can this all be illustrated through the example of a number talk? Join us for these musings. Did you miss last week’s session? Never fear! Click here to listen to Audrey Mendivil’s session on creating professional learning for change. In my last post for this newsletter, I wrote about Grace Chen’s (@graceachen) speech at Twitter Math Camp during which she asked us to ponder the intersection between politics, social justice, and our work as math educators. (If you missed her talk, you can find part one here and part two here.) She has continued the conversation with more blog posts that you can read about here. Her most recent post unpacks and analyzes the concept of diversity and how it is framed in our work and has sparked some insightful comments. What would you add to the discussion? It seems that there is a resurgence of the math and social justice movement in the MTBoS world and I wanted to curate some of the work that is being conducted. I hope that you find these resources useful in furthering your own exploration about math education, social justice, equality, fairness, and politics. This is by no means an exhaustive list. Please share the resources I missed with me on Twitter (@mathgeek76) and I’ll add them in my next post for the newsletter. In the math and social justice “world,” there are a few opinions and approaches. Some educators believe that students in underserved communities must learn “traditional” mathematics because math fluency is a key that grants students access to better colleges, better jobs, and more freedom. Math literacy is a ticket that leads to socio-economic advancement. There are others who think math should be a tool for students to develop their critical awareness of social inequalities and injustices in this world. There are still others that strive to question the fairness and justice of the sorting algorithms we use in math education such as grading, tracking, course placement, instruction, and assessments. I won’t sort the following resources into these categories (nor will I weigh the pros and cons of each approach), but I offer you these categories as a way to structure your own professional learning. Cathy O’Neil’s (@mathbabedotorg) powerful TED talk about the roles that algorithms and big data play in how society is structured is a great starting point. You can read her blog here. She also has a book out called Weapons of Math Destruction that you should check out. Annie Perkins (@Anniekperkins) is starting a book study for teachers on this book as well as Black Stats by Monique Morris. You can read more about Annie’s book club on her blog. Paolo Freire’s book Pedagogy of the Oppressed was published in 1968 which doesn’t make it standard #MTBoS material, but should be mentioned. It’s rich with social theory and takes a zoomed out view on how education can be a liberating force for social equality or an oppressive force that seeks to reproduce socio-economic inequalities. It’s a long read, but worth the effort. It may change your life. You can find a PDF version of the text here. Bob Moses’s Radical Equations is also an excellent book about how math education can be a force for social justice. You can read more about his Algebra Project initiative here. Here are a few others in the MTBoS community that are writing about the politics and education that you may find worth following. The names are hyperlinked to their websites. Please Tweet me (@mathgeek76) the names of others I should add to this list. Lastly, “Creating Balance in an Unjust World” is an annual conference that focuses on math education and social justice. You’ll find resources on their website and more information about the conference for 2018 on their website. Teachers also discussed ways to get to know their students and to have their students get to know them. If you have never participated in a Twitter chat, a good introduction to how they work and how to participate can be found here. This spreadsheet of Twitter users and bloggers is also a great resource to connect with other teachers of the same course or age group. Each tab corresponds to a course or subset of math teaching. You may find it helpful to follow the teachers in your tab on Twitter, add their blogs to your blogroll, and tag them in specific questions. Students’ love for mathematics ends when they surrender sense making and yield to senseless memorization. Through powerful examples, the webinar explores: reasons for the difficulty, insights into sound pedagogy, engaging tasks, interactive fraction apps, and bridges to the future. Presented by Dr. Monica Neagoy. How can we use best practices in teaching to inform our professional development design? What elements form effective professional development, and how do they relate to lesson planning, formative assessment, and human nature? Join us as we learn together and leave with a plan of action for your future professional development design. Did you miss last week’s Global Math Department? 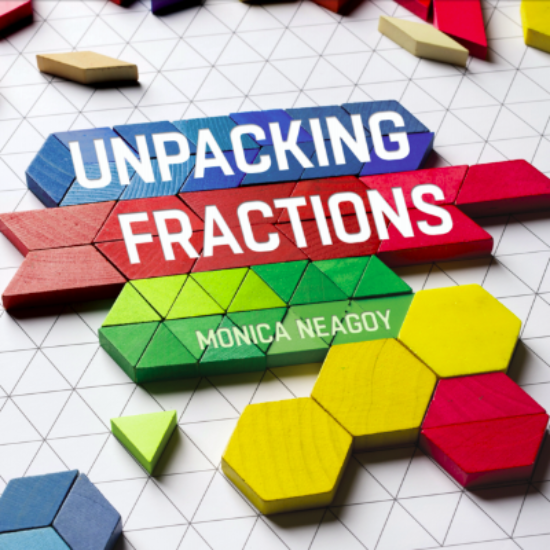 Click here to listen to Dr. Monica Neagoy talk about Unpacking Fractions: Moving from Senseless Rote to Sense Making & Joy. What place does pencil and paper have in my students’ learning and understanding of mathematics? Her descriptive and thorough blog post, Blending Technology with Paper and Pencil, will demonstrate how descriptive, informative, and thorough Jennifer is when it comes to meaningful learning of mathematics in her classrooms. She shares evidence of student work not only through technology, paper and pencil, but with strategies like “Notice and Note” to use “words, pictures, and numbers to write and sketch what they saw.” This blog post is jam packed with great ideas, strategies, and curiosities all with the intention to help our students remember the math they learn. “Notice and Note” aims to do that. I am convinced that we need to pay attention to when we are asking, encouraging, and requiring students to use pencil and paper to create a record of what they are learning…so that students…have a better chance of remembering it later. If you’re interested in learning more about making math stick, I highly recommend the book Make It Stick. There have been some great suggestions recently regarding favourite math tasks and activities for getting class started on the right foot. Many teachers and students have already started the 2017-18 school year but there are many more that have yet to commence. Most public schools in Canada will have their first day of school during the first week in September. 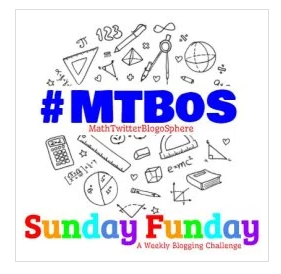 Check out the hashtags #mtbosfd (short for MTBoS First Day) and #myfavoritemathtaskis for ideas on how to start out the year. Whatever task you might use, I believe it should arouse your students’ curiosity, be accessible to all of your students, and generate discussion about different solving strategies. A favourite problem of mine that I believe meets these criteria is called The Four Coins Problem. “You’re creating a new coin system for your country. You must use only four coin values and you must be able to create the values 1 through 10 using one coin at a minimum and two coins maximum.” This problem is simple to state but has lots of opportunities for extension and discussion. I hope you all have an amazing start back to school, refreshed and inspired for a great year ahead. A special welcome as well to teachers starting their very first year in the classroom with all the excitement and anxiety that this entails. More Talking = More Learning! Sara VanDerWerf is at it again bringing us gems for starting up a new school year. Her recent post, entitled STAND & TALKS. The Best Thing I Ever Did to Get Students Talking to One Another, is very thorough and includes a description of the routine, a sample scenario, and tons of examples of how she uses the routine as well as other routines she incorporates together with a Stand & Talk (S&T). Essentially, an S&T is a lot like Think, Pair, Share or Turn & Talk, but with the add-in that students stand and find a partner in another area of the room to discuss with before the task is given. Sara says this gets nearly all students talking every time she uses it, and has the added bonus of a possible energy-injector in a stale classroom. Whatever your goals this upcoming school year, this routine seems to be one that will really go far to get students processing the mathematics as well as owning their learning. Another must-read is an oldie but a goodie from Geoff Krall, found here. Entitled Seven (Sneaky) Activities to Get Your Students Talking Mathematically, Geoff highlights some amazing activities that are sure to get discourse going in your classroom. Recaps from Twitter Math Camp, 2017 Edition! Speakers will share some of their favorite moments from TMC2017. Here are links from the slides that have been organized into a convenient Google Doc. Featuring presenters @jkerble @joeykelly89 @brettegarner @tcesarski @madisonsandig4 @JamiDanielle @AGEiland @KeplerTrish and host Deb Boden. Students’ love for mathematics ends when they surrender sense making and yield to senseless memorization. Through powerful examples, the webinar explores: reasons for the difficulty, insights into sound pedagogy, engaging tasks, interactive fraction apps, and bridges to the future. Last week at Global Math TMC17 attendees shared their highlights from Twitter Math Camp. Click here to check it out! Also, if Podcasts are your thing, click here to check out former GMD Presentations in Podcast form! I try to read the (hundreds of) blogs I follow on my Bloglovin feed, but when I HAVE to do a quick scan due to crunch time, there are four bloggers whose blogs I must read from start to finish EVERY TIME. Even when I say to myself, “Oh, I can skip this one for now,” without fail, I am drawn into their writing, their ideas, and their knack of discovering something that, without it, feels like I’ve had a complete void in my classroom! Their blogs are chock full of information that can be used THAT DAY. If you don’t follow these four bloggers, be sure to do so right now! The first blogger is Sarah Carter of Math Equals Love fame. She recently assembled her best ideas in 21 Ideas for the First Week of School and Most Referenced Posters just for her readers. 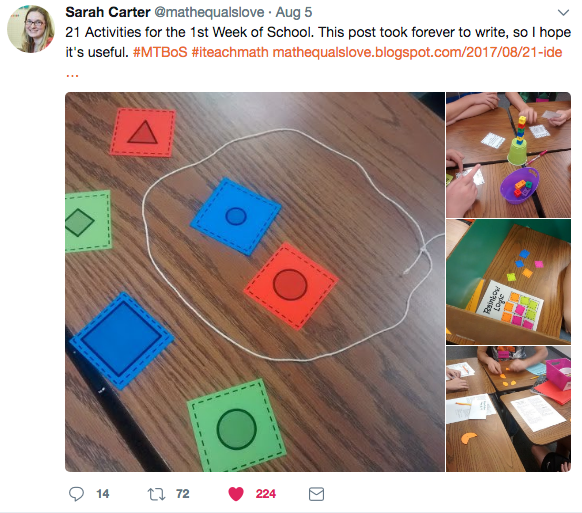 I often see Sarah’s ideas tweeted and blogged about all over the #MTBoS and as a veteran teacher, I use many of her ideas and find them to be very fresh and student-centered. The second blogger is Sara VanDerWerf. I heard Sara’s keynote last year at the Desmos pre-conference at Twitter Math Camp, and in just a few seconds I could tell that when Sara speaks, people listen. She just summed up her first week ideas this year in 1st Week Posts – Plus Something New. I see so many blog posts and tweets referencing her for name tents, the 5×5 game, and 100 Numbers, The Backwards Bike, and more. She is incredible, and I am so thankful for her many ideas. I use many of them in my classroom with much success. The third blogger I can’t get enough of is Jo Morgan of Resourceaholic. In Math Gems, she shares news, ideas, and resources for math(s) teachers. Jo is from England, and I was lucky enough to meet her when I attended the Complete Maths workshop in London this summer (which I found on her conference list.) At the conference, math teachers were asking her for selfies and even on the train they were thanking her for all she does…she is like British royalty when it comes to mathematics!! You will always find a new resource in her blog, whichever side of the pond you are on! And the fourth blogger is Fawn Nguyen from Finding Ways. Fawn always has something important and meaningful to say and often in a humorous way. She says it with such heart and soul that all I know is I want to be a student in her class right now. To me, she is like a lioness fiercely protecting her cubs when she talks of her students. I heard her keynote: Teacher Woman (poor audio quality on video so here is a PDF version) at Twitter Math Camp ‘15, and she had me in tears and laughing hysterically almost at the same time. Her passion for teaching is evident in her extraordinary writing. You can see her humor in this post: These Twenty Things and if you haven’t seen her sites http://www.visualpatterns.org/ or http://www.mathtalks.net/, you MUST get on that! Many bloggers speak of using her Noah’s Ark activity on the first day of school (including me!) Here is her latest blog, All I Got on Classroom Management, which is quite a bit! I only mentioned four bloggers this week, but there are so many other amazing ones out there. You can find a TON of them at the weekly blogging challenge (#SundayFunday) that Julie Reulbach has organized. 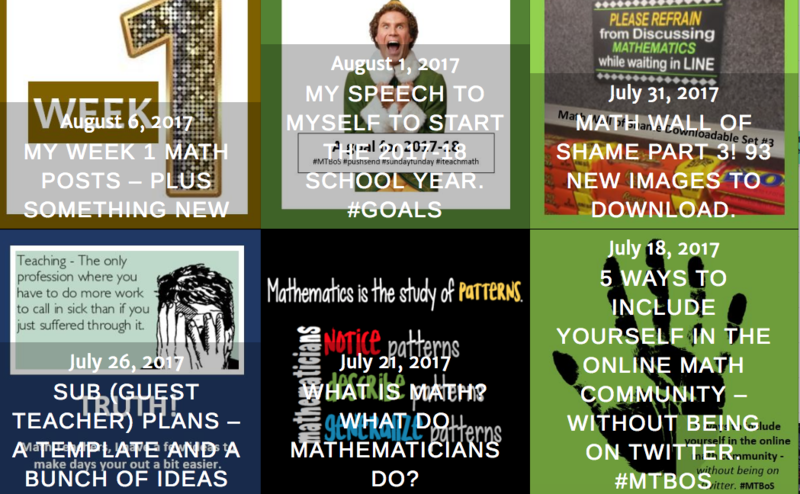 The first one is A Collection of Goals Across the MTBoS and the second is First Day blogs. Click here to submit for the next challenge. Don’t be nervous about blogging! Just do it and #pushsend! Looking to Join the Elementary Conversation? Week 1 – Brian shared lots of routines and ideas to kick off the school year. 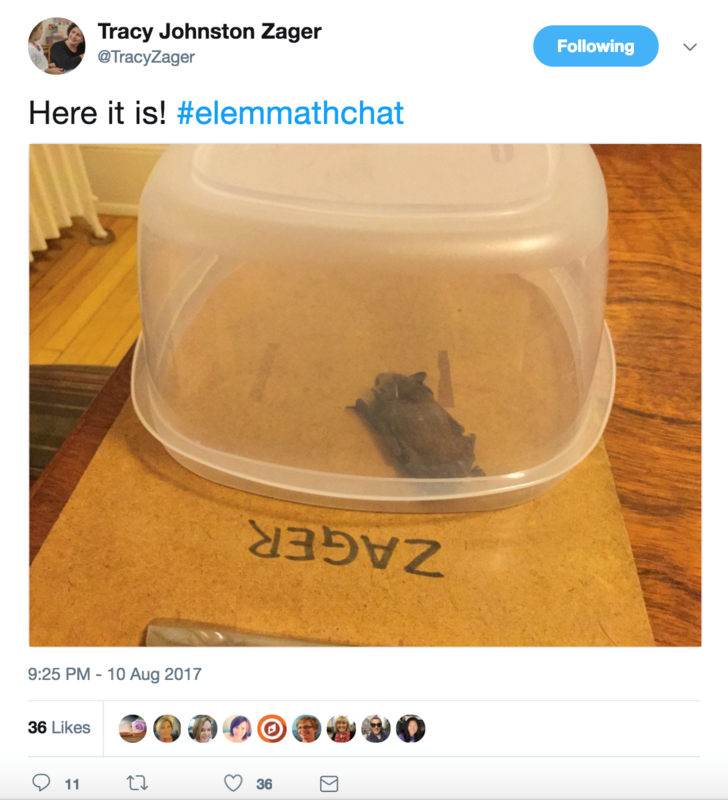 Week 2 – Tracy Zager shared ways to re-introduce your students to mathematics. She also introduced us to a guest that flew in during the chat. This week, Annie Fetter takes the reigns and it’s sure to be a blast. You can join the action by following the hashtag #ElemMathChat. If you can’t get enough, NCTM & Zak Champagne host an elementary chat on the second Wednesday of every month. (#TCMChat) There are lots of thoughtful conversations taking place that center around a recent article from Teaching Children Mathematics. If you have an elementary friend that doesn’t receive this newsletter, do them a favor and share. Their students will thank you for it. The beginning of the school year can be really overwhelming, whether you’re a first year teacher or a 10th year teacher or a 30th year teacher! The first is a couple of weeks old, and comes from Julie Reulbach (@jreulbach). Julie, along with a few other Twitter Math Camp attendees, is helping to get us all writing and reflecting about the beginning of the school year. I truly believe that two of the most important things for us to get better as math teachers are 1) to reflect on our own teaching and 2) to build community with others who are like minded, thus ensuring we are not isolated. So join in, even if you’re late in starting, like me! Here are the details about how to get involved. The second was a post from Nancy Pendleton, who was asking for some advice for the first day of a first year teacher. There are a lot of great curricula out there, but I’m very excited about an effort being led by two Southern California 8th grade teachers – Yekaterina Milvidskaia and Tiana Tebelman – who are combining problem-based learning with Complex Instruction and the ideas described in Jo Boaler’s book Mathematical Mindsets. Their site now has two units: Linear Functions and Transformational Geometry, which they created in conjunction with youcubed.org. In their section on group work, Yekaterina and Tiana share their overall philosophy, which comes from Complex Instruction. They have developed interesting group roles so that all students in a group have important contributions to make. That has been one of the challenging aspects of group roles for me when I have used them (for example, a common group role is Resource Manager, which often means the task of getting supplies at the start of class and then hanging out for the rest of the time), so I was especially excited to see these more evenly distributed roles. The roles they have come up with are Coach, Accountability Manager, Skeptic, and Team Captain. Each role card also includes sentence stems so that students have clear scaffolds and language to use. In helping students get better at collaboration, Yekaterina and Tiana use two types of group assessments: a Participation Quiz and an Accountability Quiz. The first one helps students learn what equitable group work and real collaboration look and sound like. The teacher lets students know their expectations regarding how the groups will work together, then observes how each group interacts, writing down specific behaviors and student quotes, and then reporting this back to students so that they have clear feedback. The Accountability Quiz helps all students engage more fully with the mathematics they are learning and make sure that different approaches are discussed fully and no student is left behind. Each group prepares and when they believe they are ready, the teacher selects a student to question, using differentiated questions to challenge all students. They may select additional questions to further probe how well the team has discussed and understands the mathematics on which they are being assessed. In order for the team to pass, each selected student must demonstrate strong understanding, but they can regroup and work together and have multiple opportunities to be assessed. One thing I love about this strategy is that the teacher models the kind of questioning strategies that we want students to be internalizing in order to build a culture of skeptical peers in the classroom. I wonder if eventually, the role of questioner can be passed to other students to create even more student agency. Collaborative and inquiry-based learning often includes student presentations and the folks at the Art of Mathematics have some great ideas for doing this better. It makes me really happy to see teachers at the college level increasing access to mathematics learning and refining strategies that help students develop agency and ownership of mathematics. Join us for our FIRST session of the 2017-18 school year! 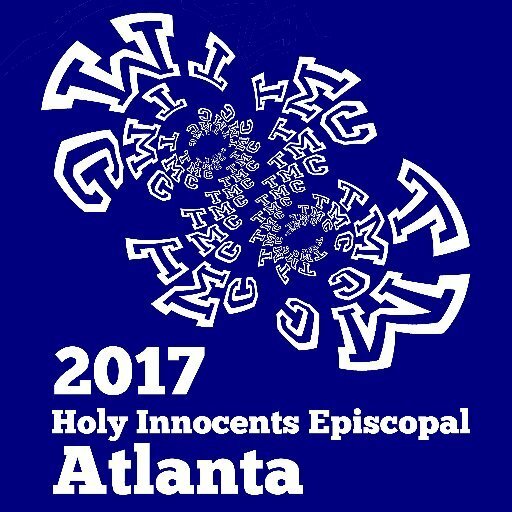 Speakers will share recaps and favorite takeaways from Twitter Math Camp 2017 which recently took place in Atlanta, Georgia. Join us to be inspired and get some new ideas you’ll want to implement in the upcoming school year. Are you new to Global Math Department? Do you want to check out sessions from last year that you might have missed? Click here to learn more about upcoming sessions and to watch previously recorded sessions. The math department of your dreams is available 24 hours a day, 7 days a week! 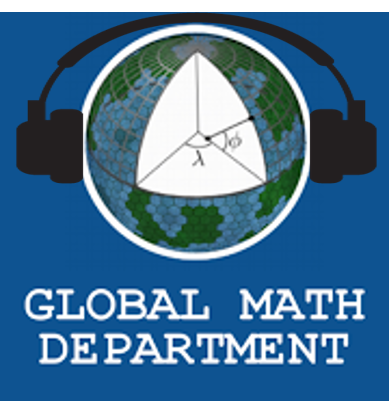 Welcome back to the Global Math Department newsletter for the 2017-18 school year! Last year we bid farewell to several veteran writers – but never fear! – we’ve gathered together a crew of fresh new voices in addition to a few writers sticking with us for another year. Each week they’re excited to share with you the blog posts, Twitter conversations, and other happenings from across the mathematical internet that resonate with them. We hope you enjoy the newsletter this year, and don’t hesitate to Tweet a word of thanks to a writer if you like something they share. I recently participated in my first Twitter Math Camp (TMC). I was blown away, and I want to tell you why. TMC is unlike most math conferences because there are no attendees; instead, everyone is a participant. Because it is a community driven, grassroots conference for math educators by math educators, everyone shares the responsibility to create an inspirational, empowering, and inclusive culture that seeks to build the capacity of everyone in the community. Next year’s TMC is in Cleveland, OH on July 19-22. Mark your calendars and consider yourself invited. I can’t possibly capture the scope and depth of my learning and all who attended. While I’ll still share one or two of my learning highlights, I invite you to check out the TMC wiki for presentations, workshops, and other inspirations from the community. Grace Chen (@graceachen) delivered a powerful keynote speech about her life story and invited us to ponder the question: Is teaching necessarily political? Her answer: It’s complicated. And she asked: What politically motivated stereotypes could you disrupt in your school and classrooms? What counterstories would offer instead? In what ways do these stereotypes and stories create a culture of “normalcy” about who can learn and have access to high level mathematics and who cannot? You can read more about her work on Twitter and on her blog. Sam Shah (@samjshah) invites us to make joy more visual in the math classroom. He shares his simple practice of letting students share with the classroom community when they experience joy during a lesson. His five minute talk is well worth the time. Or you can read his blog post about it. My most important learning from TMC (#1TMCthing) is the power of a community that chooses to gather for the sake of learning together and sharing ideas. The commitment and passion to become more effective math teachers and more inspired math geeks was palpable and contagious last month. But our community has been weakened by a lack of diversity across the grade levels for years. Graham Fletcher (@gfletchy) shared this image during his engaging and compelling keynote (11:30 mark on this video). It shows data from TMC 2015, but also closely represented the population in 2017. To become a stronger, more brilliant community, we need to learn more from members in elementary education. If you are an elementary teacher, I encourage you to give a talk at TMC 2018. At the very least, come participate and help us get better! We need your perspective, wisdom, and teaching techniques. If you are not an elementary teacher, extend a personal invitation to the elementary teachers you know. If you need more inspiration, check out Tracy Zager’s (@TracyZager) keynote talk on this topic at TMC 2016. Lastly, a huge thank you to Lisa Henry (@lmhenry9) and all the volunteers who make TMC happen. You can follow them on Twitter at @TMathC. Hope to see you there next year! 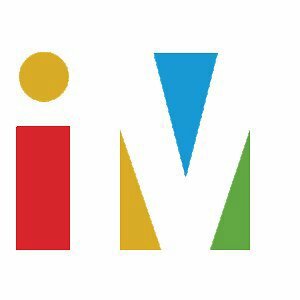 In case you haven’t heard… the team at Illustrative Mathematics (@IllustrateMath) wrote a FREE curriculum (yes I said FREE) for grades 6 through 8 to be released by Open Up Resources! The Illustrative Mathematics Middle School Curriculum is innovative, coherent, and provides access and rigor for all students. No stone was left unturned when crafting these materials. The level of passion and scrutiny that went into all things created is mind boggling. This curriculum “elevates mathematics instruction and sparks enjoyment of mathematics for students in a whole new way!” Just check out the work done on the embedded Geogebra applets released here. The team was led by William McCallum (@wgmccallum)–who has promised to get back to blogging more often over at Mathematical Musings. This spring he wrote a four part series on Curricular Coherence. He shared, “…a coherent curriculum, focused on how to get students up the mountain, would make sense of the journey and single out key landmarks and stretches of trail—a long path through the woods, or a steep climb up a ridge.” From what I’ve seen…I believe the team has accomplished this. You can read the rest of his first post in the series here. Another member of the Illustrative Mathematics writing team, Sadie Estrella (@wahedahbug), recently wrote about her experiences as a teacher “create(ing) content from scratch.” She goes on to write, “during this time, I had various resources I used, random texts, blog posts, etc. But never did I find any text or curriculum that I felt met the teaching philosophy I had in my head and emanated throughout my classroom. Pretty much every text I encountered looked like a replica of what I experienced as a student and that is DEF insufficient.” This resonated with me and it felt like she was in my head. Reading her post, I could feel her skepticism regarding the “whole curriculum thing (curriculum schmiculum).” She acknowledges that it took some time working on this curriculum before she was able to stand back to see its power. She shares, “what I came to realize at this moment was that good curriculum, curriculum that does a lot of the heavy lifting in math content, coherence and some teacher moves (5 practices) allows the teacher to re prioritize the work they need to do in order to support quality learning.” What a powerful statement! And it’s so true. Check out the entirety of this post over at her blog here. Kate Nowak (@k8nowak) answers the question “Do I have to do it this way?” about the Illustrative Mathematics Middle School Curriculum over at her blog. She chose a great analogy credited to someone at the Louisiana Department of Education. And then there is the work happening over at #learnwithIM. Check it out and you’ll see teachers from across the country giving up their time this summer to learn, collaborate, and grow from working with this curriculum. The decisions made by the writing team were incredibly purposeful. The curriculum tells a story. I’m so excited to see what they do next! This presentation will engage participants in considering how everyday use of formative assessment, in-the-moment classroom-based assessment techniques (observations, interviews, Show Me, hinge questions, exit tasks), directly influence and empower teacher planning and instruction AND impact student achievement!